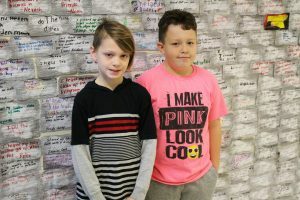 Students at Center McMechen Elementary and Washington Lands Elementary, with the help of school counselor Charlene Frazier and their teachers, created a “30 Days of Random Acts of Kindness” calendar for the month of December. Daily service projects or kind deeds were scheduled for the students to perform. Activities included decorating cups with positive messages and filling them with a hot cocoa package to be given to the warming shelter, making cards for local nursing home and assisted living residents, constructing a “Kindness Wall” and simply smiling at a stranger. “The students and I have had great discussions on what they have done so far and how the person receiving the random act of kindness has responded,” Frazier explained. With the holidays right around the corner, one of the main goals is to teach students it’s always better to give than receive throughout the year. “My hope is they will continue doing kind deeds way past December,” said Frazier. 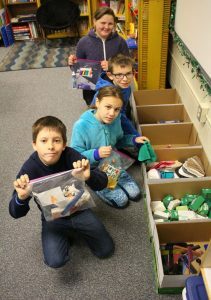 From front to back: CMES 5th grade students Tyler Blake, Jade Anderson, George Vaonakis and Kaitlyn Browning fill care packages. 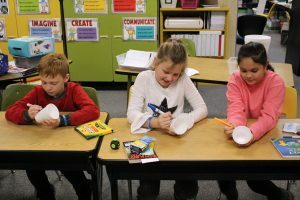 From left: Ethan Corvino, Elizabeth Lewis and Sienna Lorich decorate cups to fill with cocoa in their 4th grade classroom.